Sad news for the end of 2016: the BIB notes with great regret that DanGem Bluegrass, of Craigavon, Co. Armagh, announces the holding of a closing-down sale. DanGem Bluegrass has been a major force in promoting and sustaining bluegrass in Ireland for years. As well as holding the largest stock of banjos in the island, together with accessories, learning aids, and other instruments, Dangem held in 2009 and 2010 the first banjo camps in Ireland; founded a long-running series of monthly Bluegrass Get-Togethers in Lisburn up to this past May; promoted events such as the Bluegrass and Roots Music Night at the Spectrum Centre, Belfast, in 2011; and gave constant support and sponsorship to the annual Omagh bluegrass festival at the Ulster American Folk Park in Co. Tyrone. The Dangem staff are also individually active in bluegrass - for instance Derek Lockhart, as well as running DanGem, plays bass for the Harpers Hollow Bluegrass Band. Without DanGem, there will be a big hole in the bluegrass scene here. The BIB thanks Derek and his crew for all DanGem has done for the music over the years, and wishes them every success in the future. 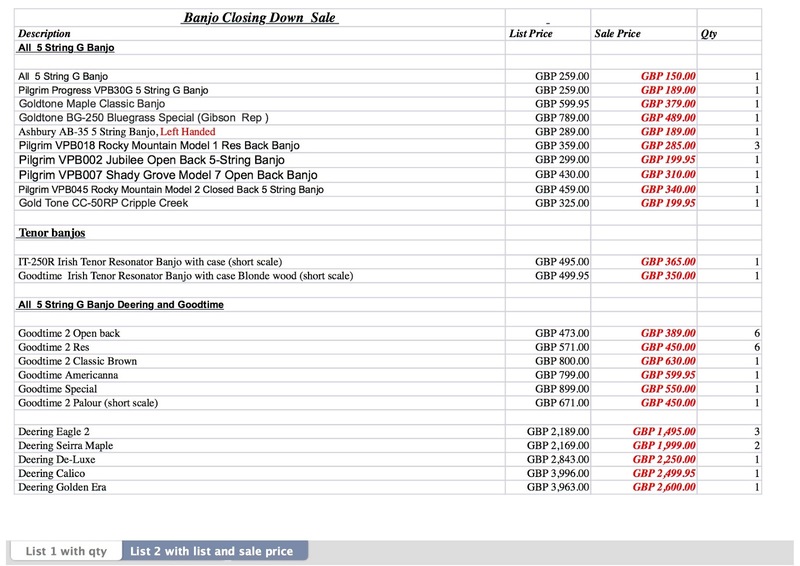 As a further benefaction, DanGem has made available to the bluegrass community the following list of good banjos available at bargain prices - and in some cases below cost - before they appear on the website. The list, predominantly of 5-strings, includes two tenors. 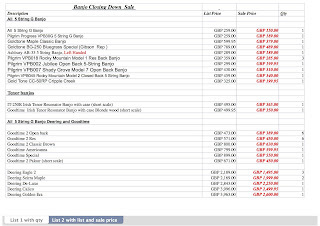 Contact Derek by e-mail for more info; some items are open to offers. Payment can be made by credit card, with packing and postage extra.